So, it's taking me a while to get back into the swing of things. 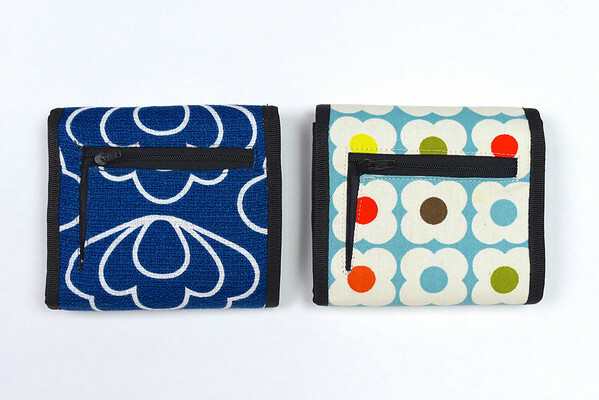 I have Zip A Bag tutorials lined up for you guys but, for some reason, it's been hard to make time to blog them. I suspect it's a combination of jet lag (even though that was - what - 4 weeks ago?) wearing off, and spring allergies kicking in, and adjusting to a full schedule of kids in school, kids in band, kids in swimming, cooking meals, laundry, shopping for elusive fabric . . . Okay, that last one was a bit of a stretch, as far as fishing for sympathy goes. And last week, they had a day off school and we ended up hosting a group of 5th graders who needed to build a cardboard castle for a school project, and could they do it in our house? Obviously, I had to say yes. So they came, armed with pure adrenaline, some very serious tools, and their focused intensity, and cut, glued, painted, built trebuchets and crossbows and wells and turrets and other wonderful things, and we ordered in pizza, and after they were done, they went outside to fight with swords and bows. So much fun. The other two kids - my biological kids, I mean - who weren't involved in this project and thus felt somewhat left out, got to make a pie with me, and work on their birthday invitation cards. I marveled at how much kids still need parents to do stuff for them in even their most independent projects: saw a cardboard tube, check a recipe, guillotine-cut cardstock, for instance. At the end of the day, I got zero work of my own done. But it was a day I wouldn't have changed a thing of - and I love the flexibility of my life where it is now so I can have days like this. There will come another day, another time, when the kids don't need us the way they do now, when they'll stop bringing friends home for projects, when they'll stop believing that cardboard is the wonder material of all time (sniff), when they're doctors and lawyers and designers and builders and engineers and scientists and farmers and managers and other grown-up things. And - the busiest of all busy jobs - parents of their own little ones. What is a day of pizza and glue guns and craft shrapnel in the big scheme of things? May we - may I - never forget that. 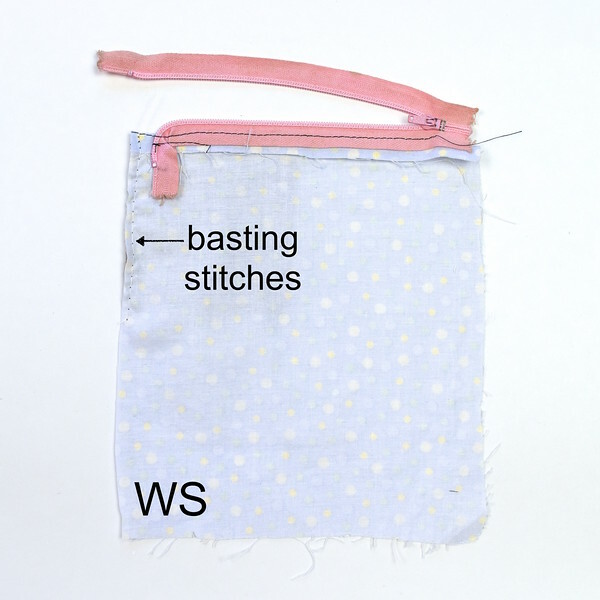 Anyway, that long story was just my excuse for not getting these last few Zip A Bag tutorials out as fast as you might've been looking forward to. I've also had to wrestle with Google storage issues since getting back from Singapore, and have had to find an alternative way to get my photos on the blog without adding to my limited remaining space quota. Finally got it sorted out, and it's a bit more time-consuming to upload pics now but, like everything else in life, I'll get used to it eventually, and wonder how I'd ever done it differently. 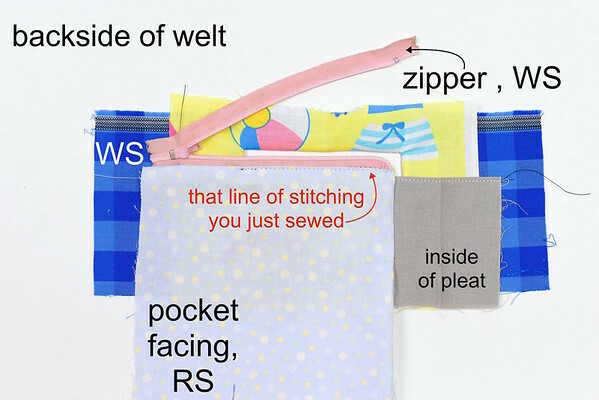 Today's tutorial is a slight departure from the usual Zip A Bag ones - we're not actually making a bag or a pouch (sacrilege!!! 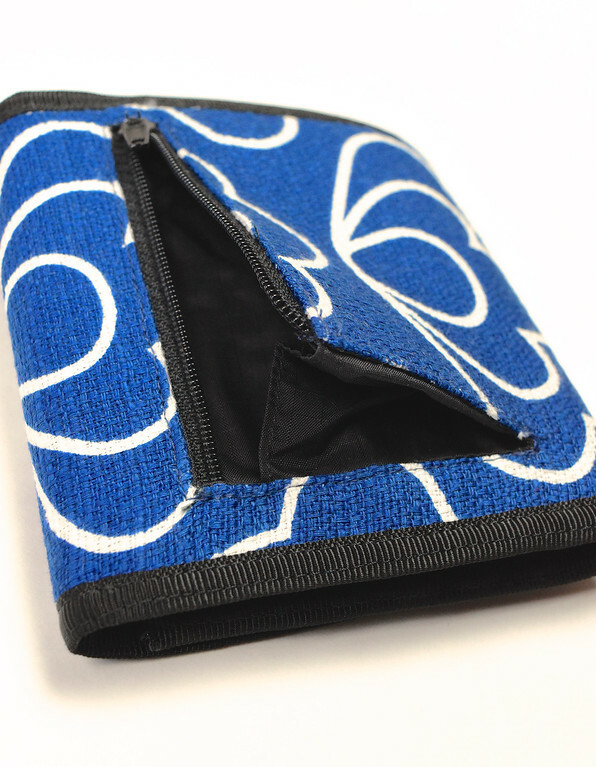 ), just a zippered compartment. 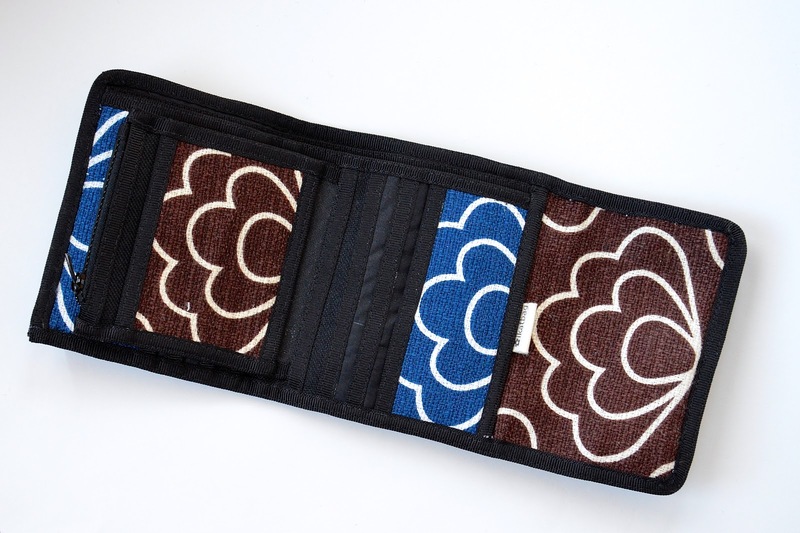 Don't gnash your teeth yet, friends - this is a very, very, very useful and nifty zippered compartment. 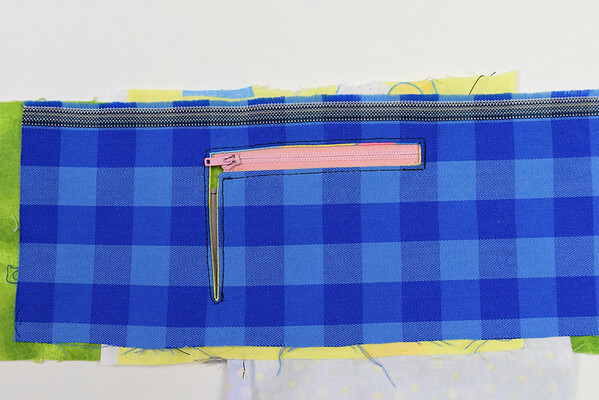 And I included it right here in the tutorial sequence because it is a pleated zippered pocket compartment, whose volume changes with the flick of the zipper pull. I use it a lot in my wallets. 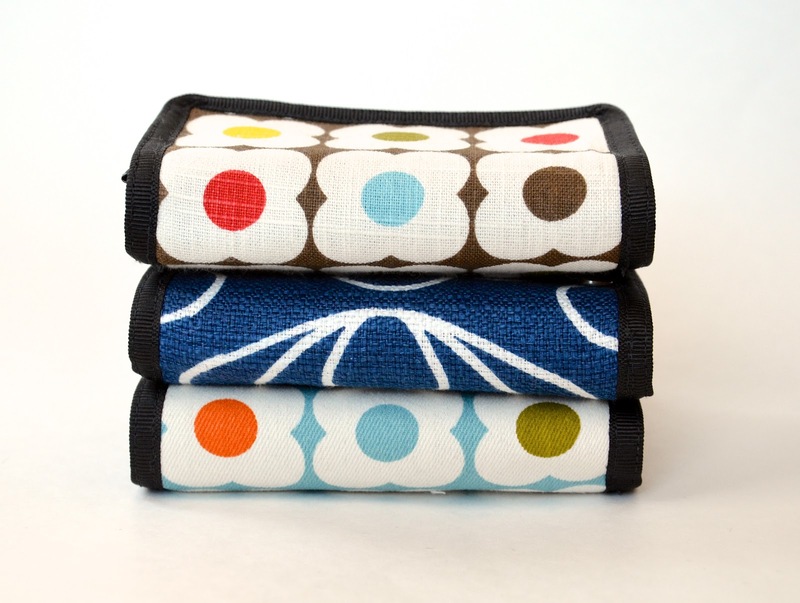 which I shall now show you brag shots of, because I love the fabrics so much. 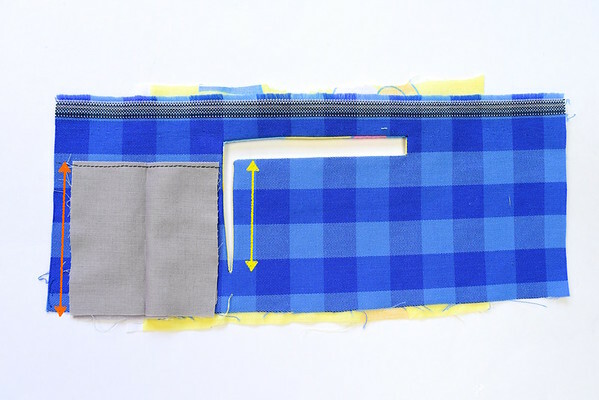 I made a blocked-mockup in brilliant technicolor for this tutorial, so you could see where each part of this zippered compartment fits in with every other part. 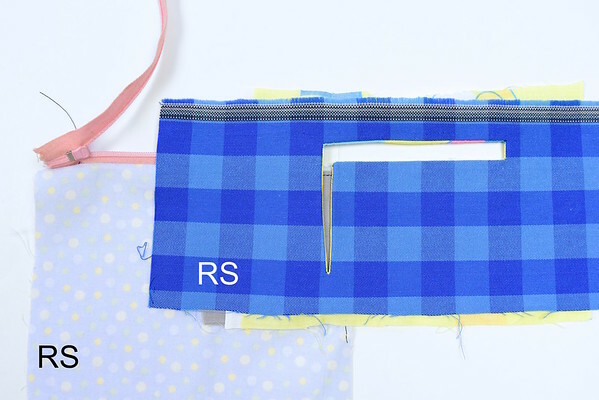 The resulting pocket is quite hideous, but that's the price we pay for illumination, right? 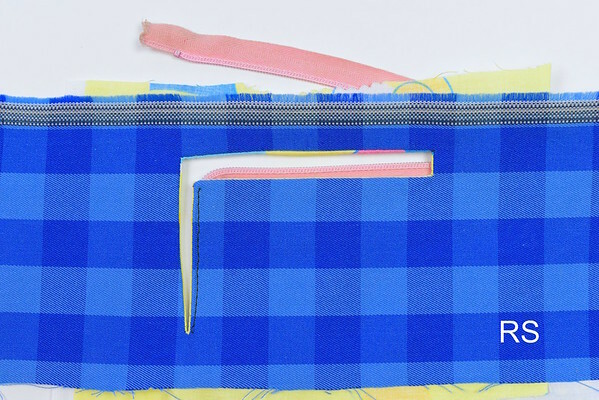 So here are the layers we need - I can't give you the exact sizes because everything depends on how large YOU want your zippered compartment to be, which, in turn, depends on the bag or pouch or wallet it belongs to. I will, however, explain the relative sizes of parts to each other, so you will have an idea of which piece needs to be larger/smaller/shorter/same size etc. as another piece. 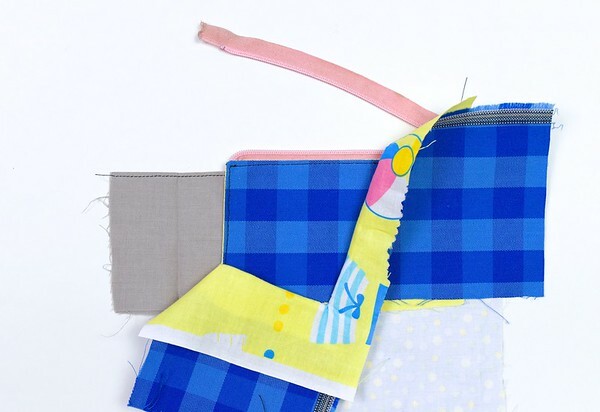 I've also used extra large pieces of fabric so that they are visible even when layered together. 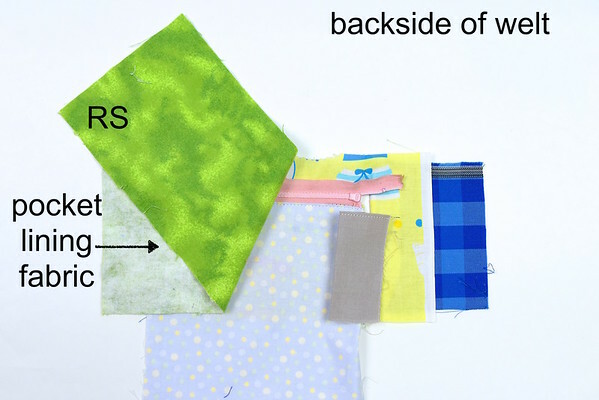 Fuse the interfacing to the WS of the outer fabric. 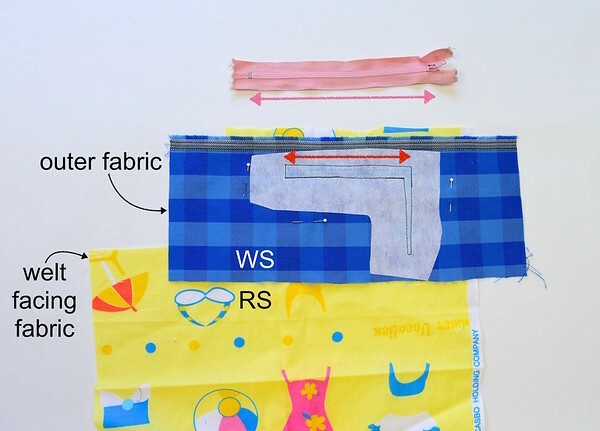 I've cut my interfacing roughly to the shape of the welt, which is a sideways L. Sometimes, you might want to interface the entire piece of outer fabric, and I will show you an example a few photos down. 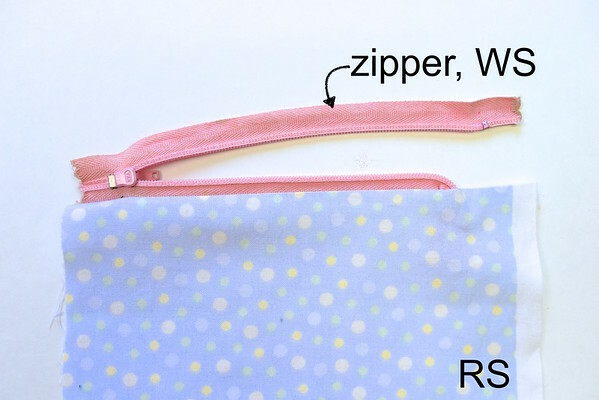 In the photo below, the zipper (pink arrow) is quite a bit longer than the welt (red arrow). 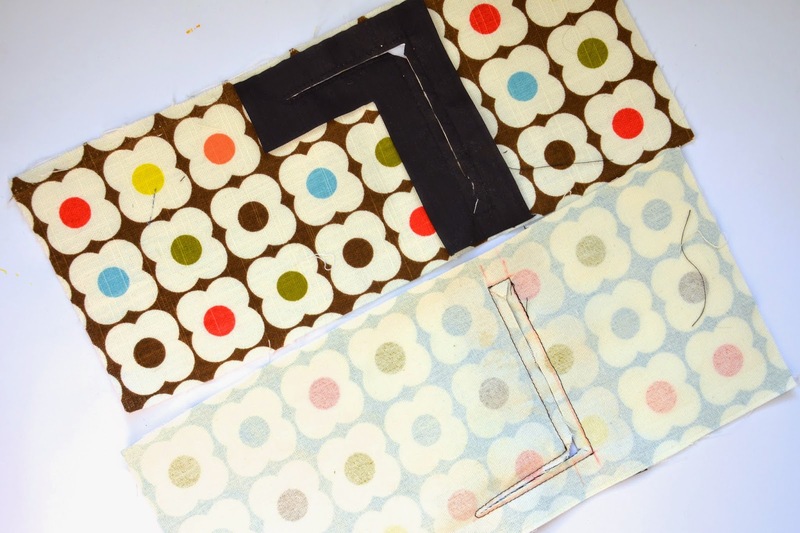 Try for at least 2" longer; you'll appreciate the extra length to manipulate later. 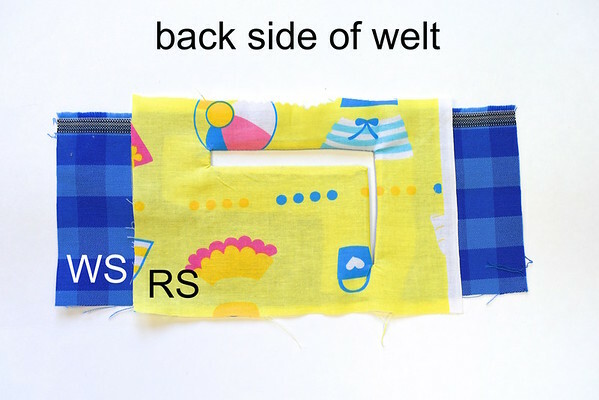 Lay the welt facing fabric behind the outer fabric, so their RS are together. 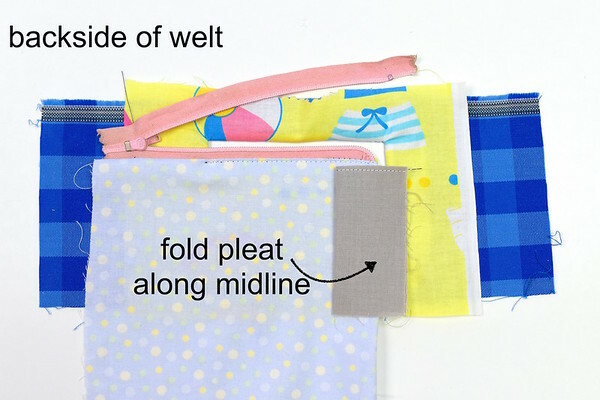 Sew around the welt. 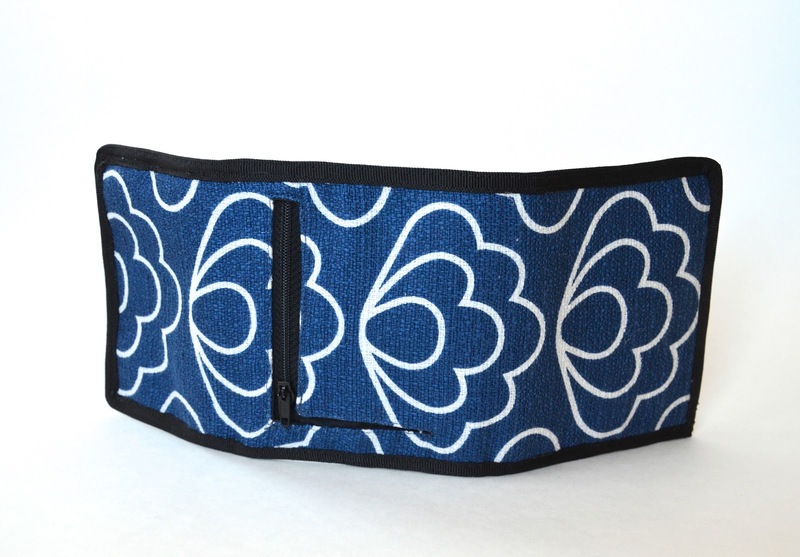 This welt will be a little thicker than the typical rectangular welt, because we need more room to curve the end of the zipper tape (this will make sense later). Mine was roughly 1/2" to 5/8". You can see the needle holes where I had a brain-dead moment, and sewed the usual thickness before realizing it was too skinny, and unpicking it. The shape of this welt, like the interfacing, is a sideways L, with the vertical section narrower (mine was 1/4" or slightly skinnier) than the horizontal section, and tapering to a point. Note the shape of the stitching line at the point. 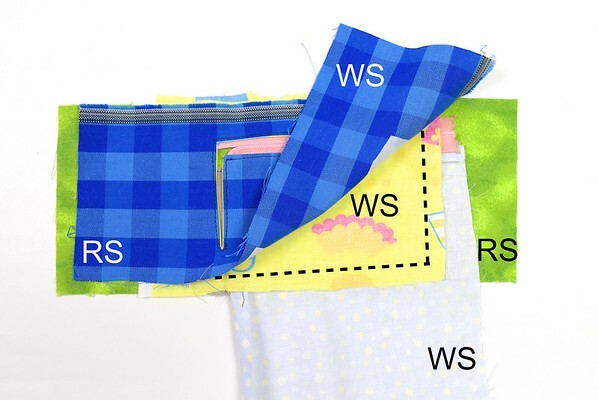 Also note that because the interfacing goes on the WS , the L is a mirror image of the finished pocket. 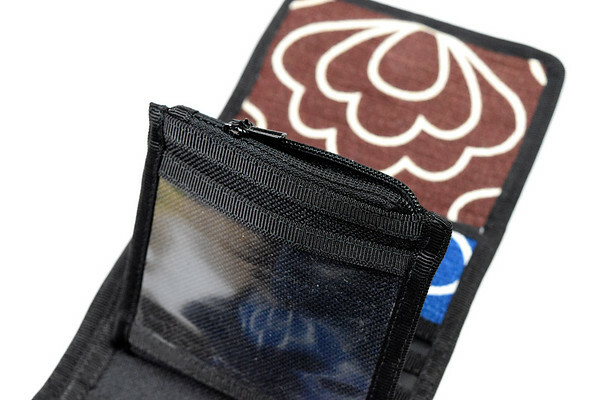 Here is a photo showing the welt in action in a real wallet. 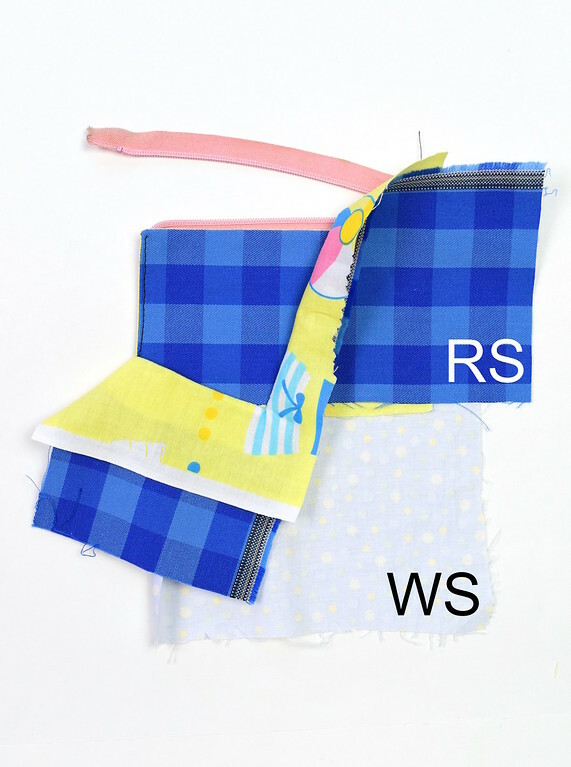 This particular fabric required complete interfacing on the WS, and not just a bubble-cut-shaped piece. 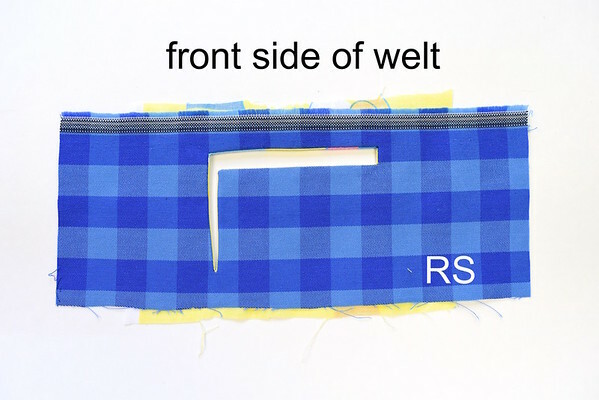 The welt facing (the black piece) was trimmed around the welt, to reduce bulk. the corners of the welt lie perfectly flat. Press and set aside. 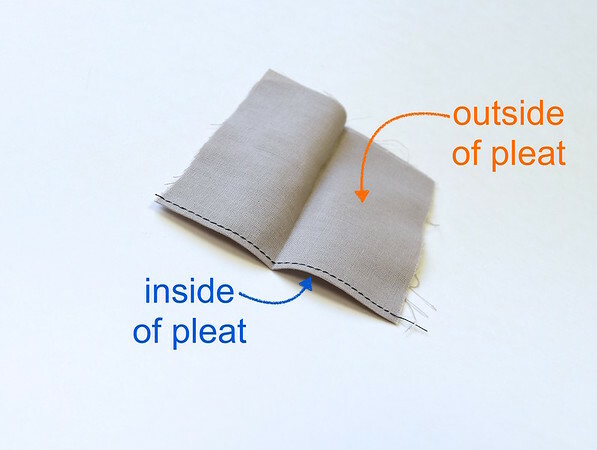 Cut a piece of fabric on the fold, to make the pleat. The dimensions will be explained later. 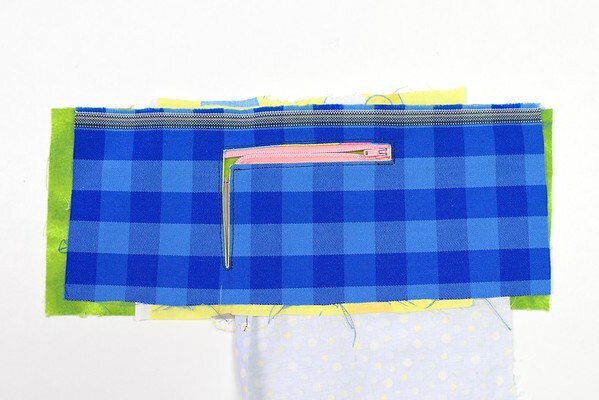 Fold this pleat fabric along its midline, press, and topstitch along the fold. The height of this pleat piece (orange arrow) should be greater than the vertical section of the welt (yellow arrow). 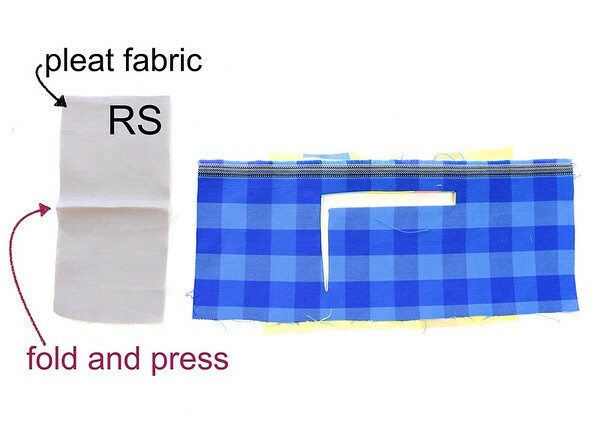 The width of this pleat piece should be the [desired depth or wdith of the pleat + SA] x 2. 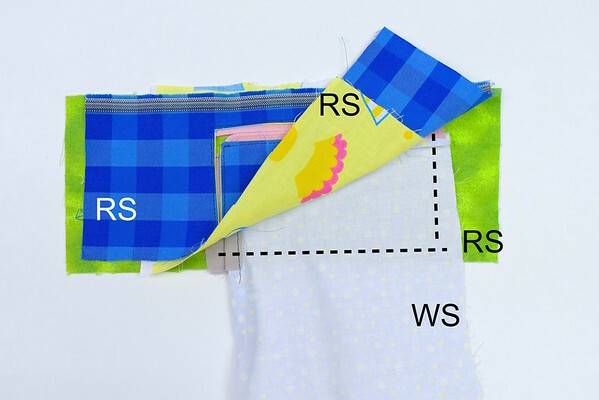 Lay the WS of the zipper on the RS of the pocket facing fabric. 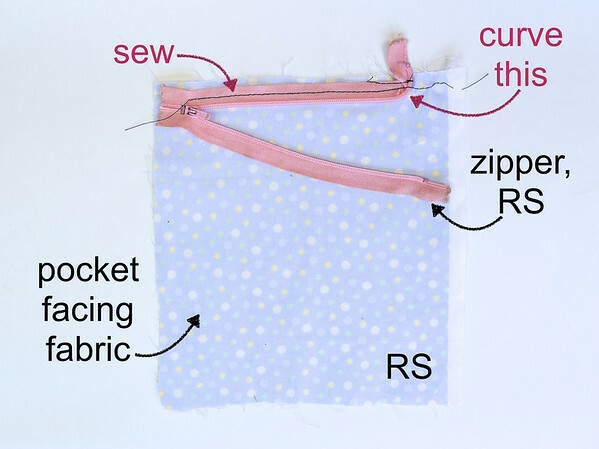 Sew one side of the zipper tape to the top edge of the fabric, as shown. 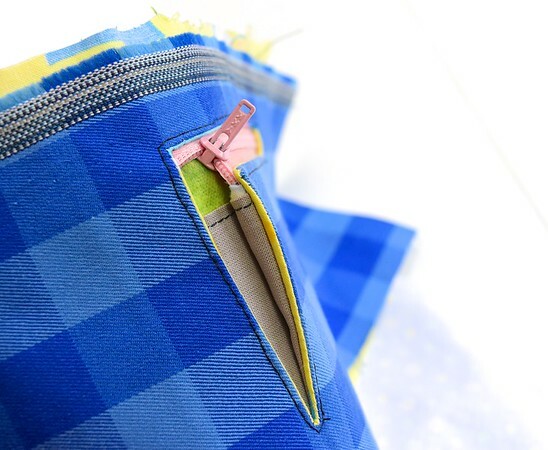 Curve the head end of the zipper tape into the SA region of the fabric. 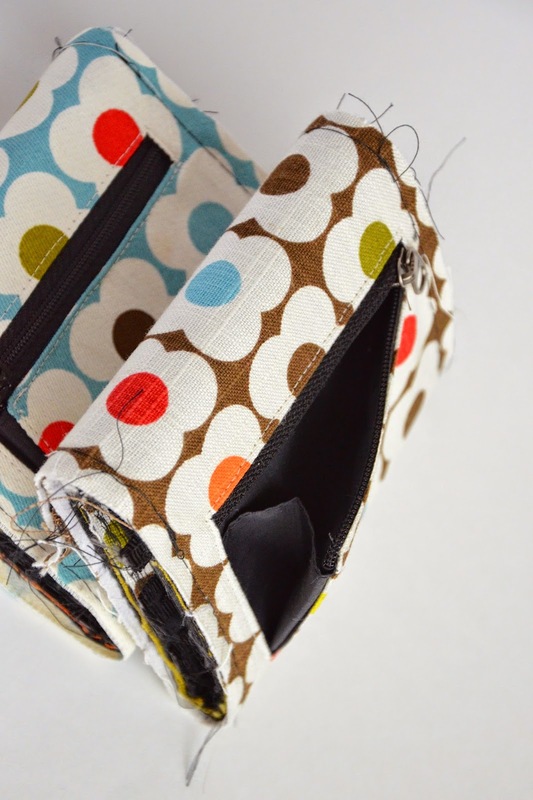 That head end needs to be curved at 90 degrees from the rest of the zipper tape. Baste an extra line of stitches to secure it in place. and this is the RS. 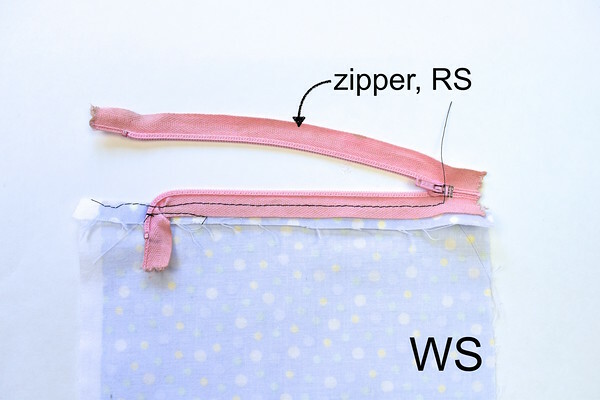 Notice the curved head end of the zipper tape disappearing neatly into the SA. 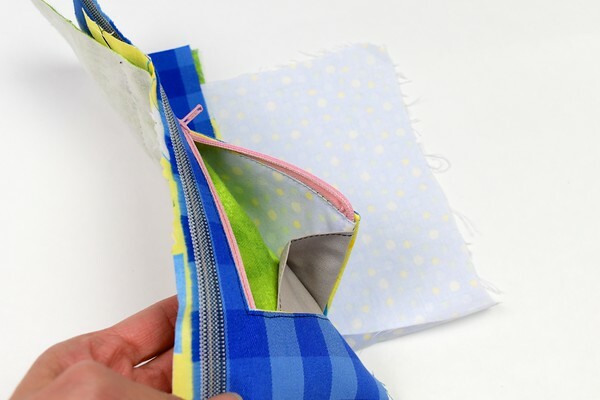 Leave the other side of the zipper tape free. 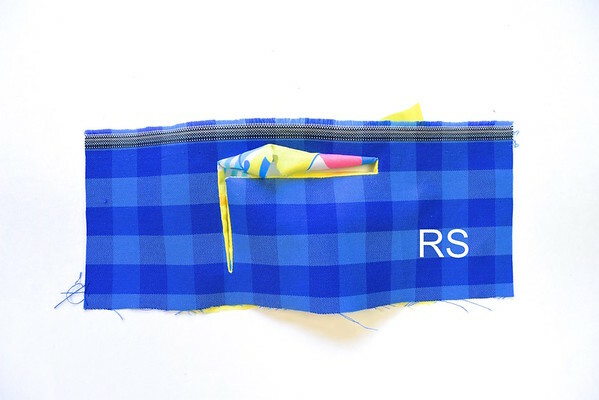 one side of the pleat protrudes beyond the curved end of the zipper (see blue arrow of next photo) - this is the SA. 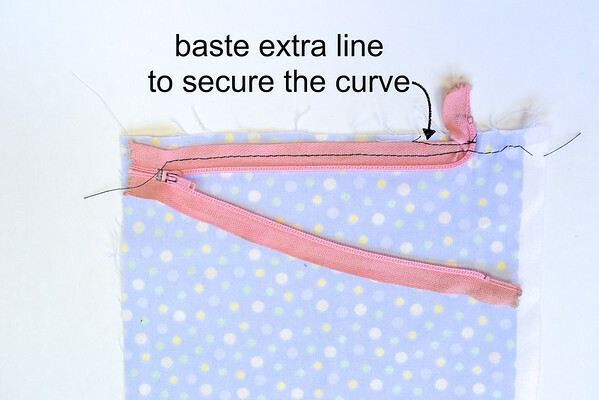 Baste the edge of the pleat to the pocket facing fabric, and trim off the excess facing fabric. 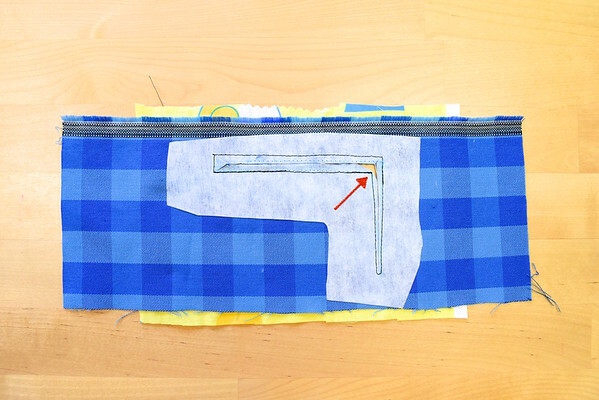 Remember that basted edge of the pleat from Step 4? 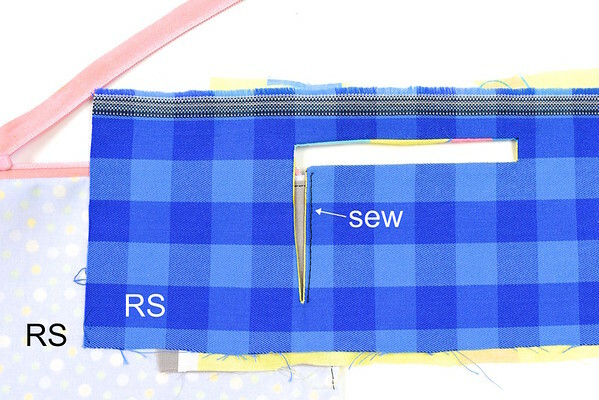 We're going to sew that same edge to the welt next. It's a bit of a circus now, so let's go slowly and refer to a multitude of photos to help. 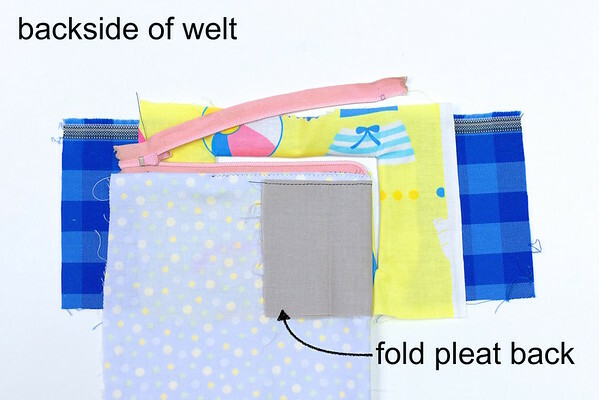 and sew the pleat to the right edge of the welt. Now let's look at the long story version - in the photo below, we'll peel back the layers so you can see exactly how everything is oriented. This is really the fiddliest part of the construction. After this, it gets a lot less manic. You'll notice that there are some "just lower than"s and "slightly lower than"s in the annotation: try to err on the side of conservative rather than liberal. I will show you later what happens if you space these edges too far apart. 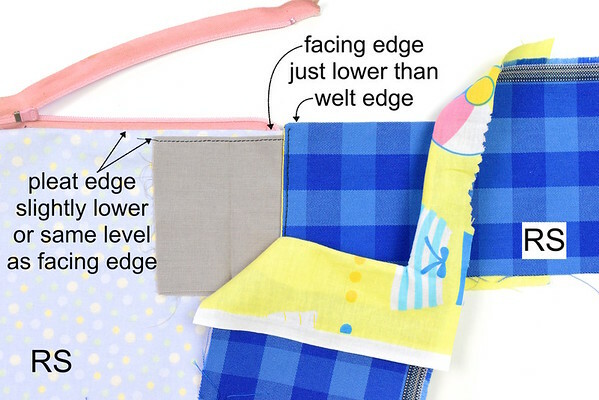 At the same time, it may not be practical to line all those edges up exactly flush, because it gets hard to neatly hide layers behind each other if they're all at the same height. 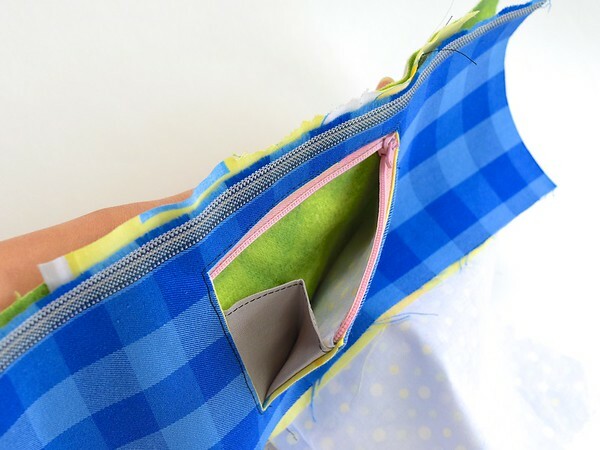 So it's a bit of a balancing act, but the more you understand the principle, and the more of these pockets you make, the more you'll get the spacing just perfect. so the curved zipper tape appears in the welt window. 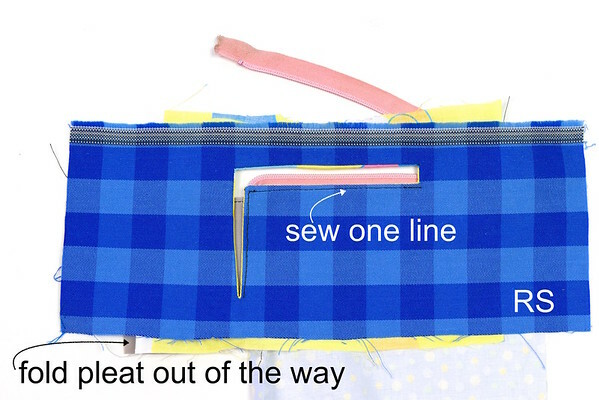 and sew along the bottom of the horizontal welt - just that one line - through the outer fabric, the welt facing fabric, the zipper tape, and the pocket facing fabric underneath. Here is the backside, so you can see what it looks like if you'd done it right. 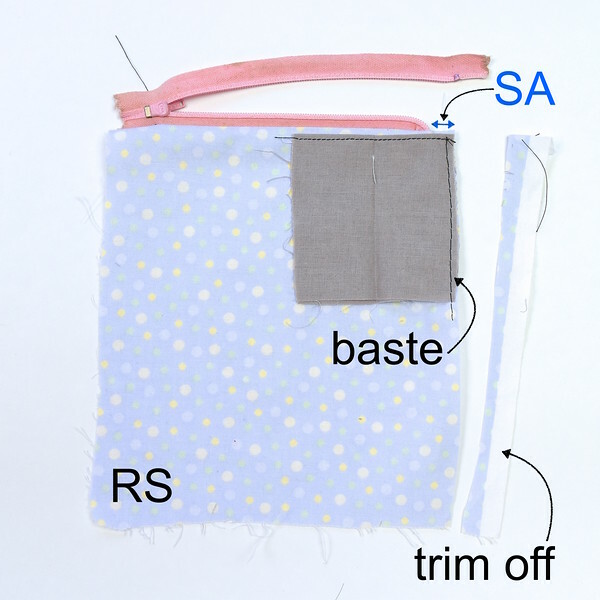 then halve it along its midline, so that its free side now overlaps the other edge of the vertical welt, as shown, ready to be stitched on. 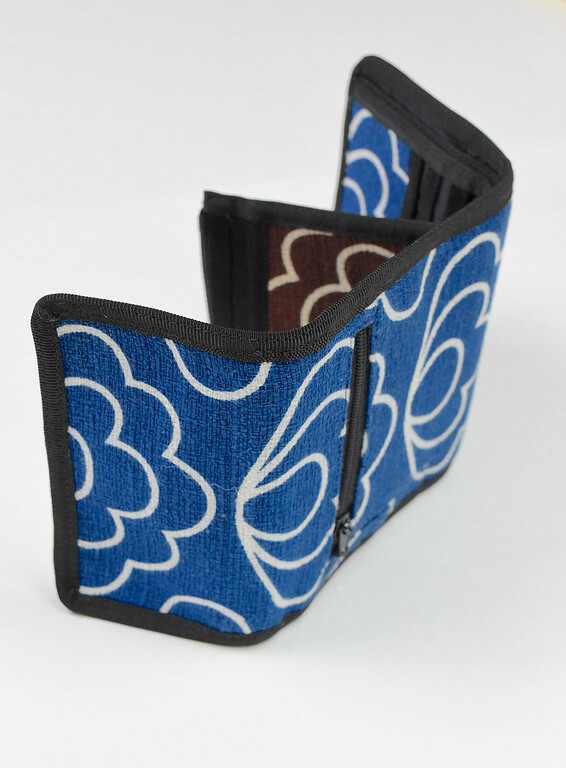 This is the backing of the entire pocket. Lay it RS down over the backside of the welt. 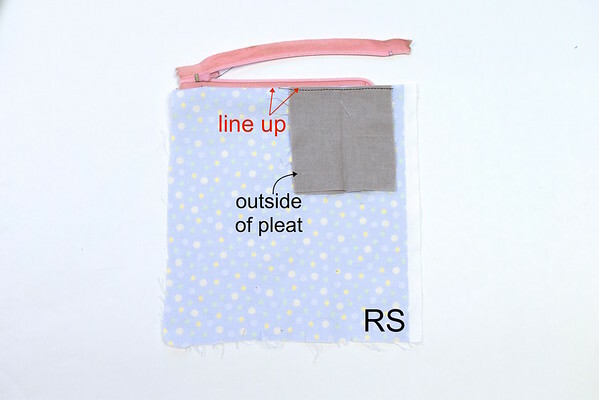 Pinning everything in place if necessary, flip the entire ensemble over to the RS, and finish stitching around the remaining edges of the welt, securing the pleat in the process, and partially attaching the pocket lining. Here is the finished welt. 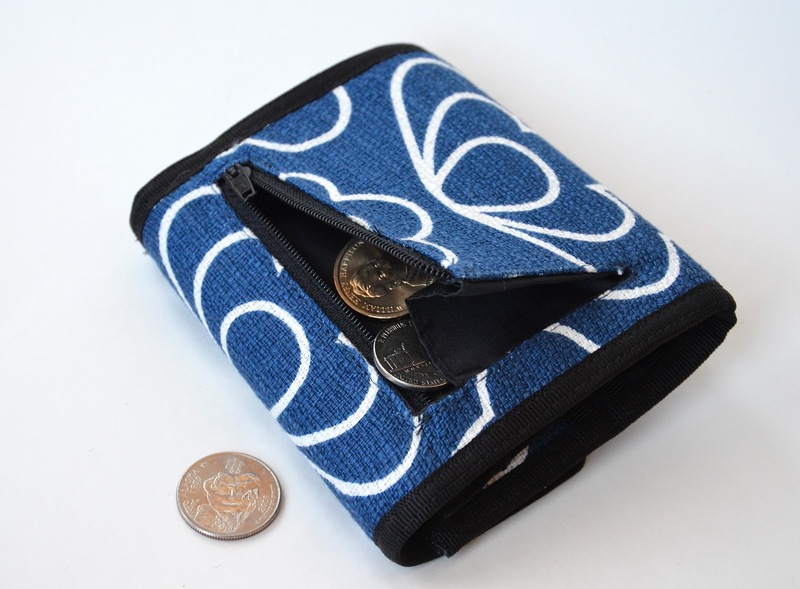 The stitching is cringeworthy, but it is a tutorial mockup, not an actual wallet, thank heavens, so we shall let it go. 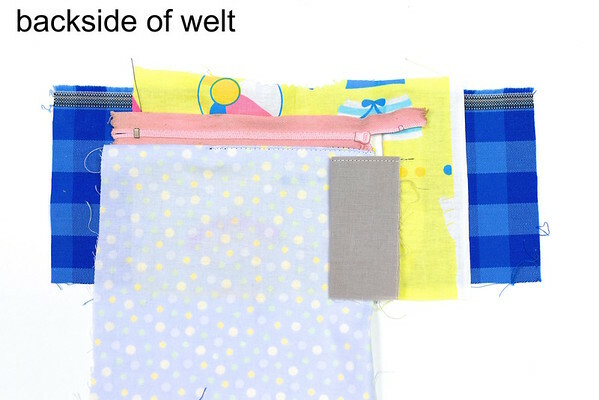 or lower the welt facing as well, and stitch through all three layers. 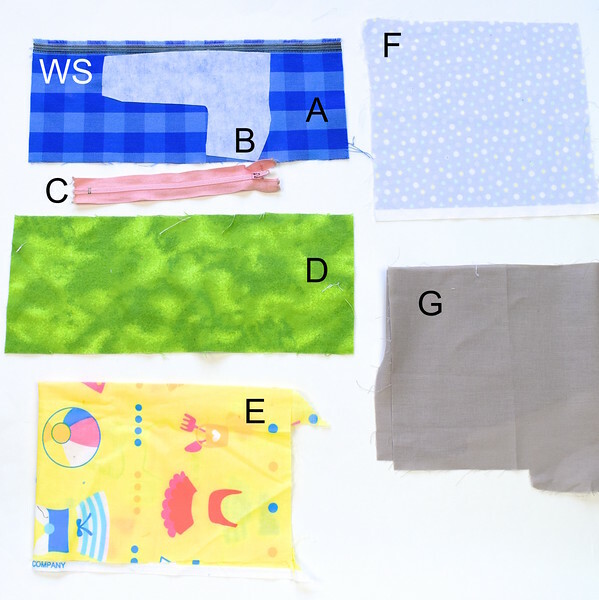 I picked the second option, just so I could attach the maximum number of layers together (excluding the outer fabric). 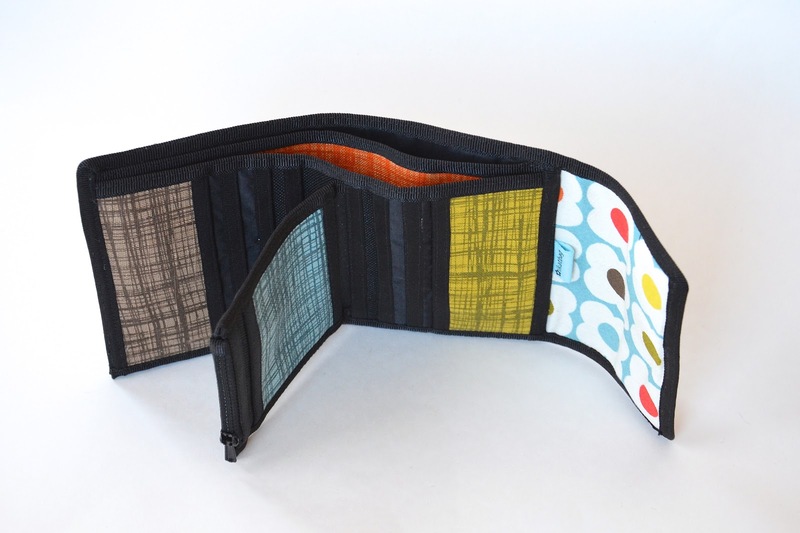 and you can declare your zippered pleated pocket compartment finished! Bravo! Tiny bit of post-mortem before we go - do you see that gap in the photo below? 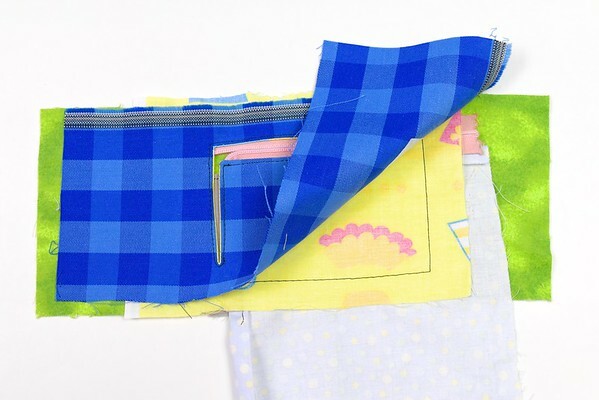 Remember: in Step 5, we discussed aligning all the edges of the different layers - the more generous you were in the spacing between edges, the bigger this final gap between the top edge of the pleat and the upper zipper tape. 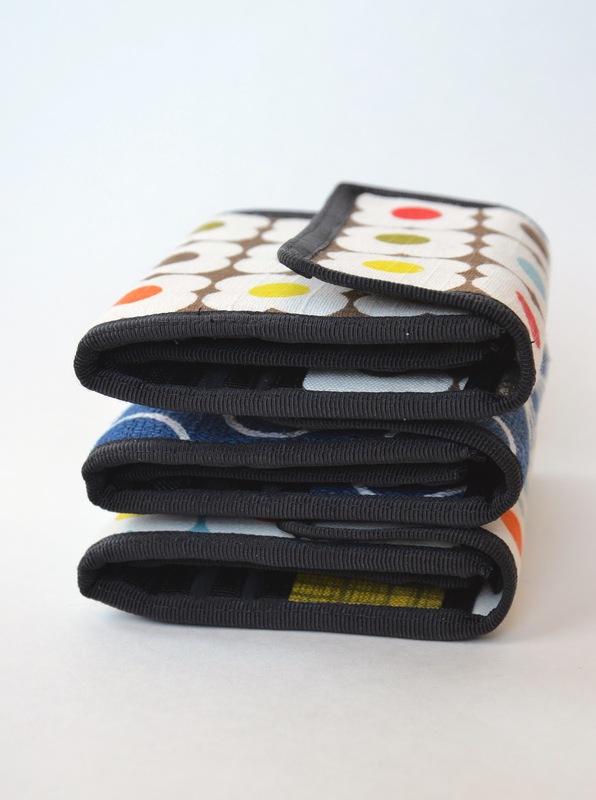 A large gap means stuff falls out more easily, should you fail to zip the compartment up fully. 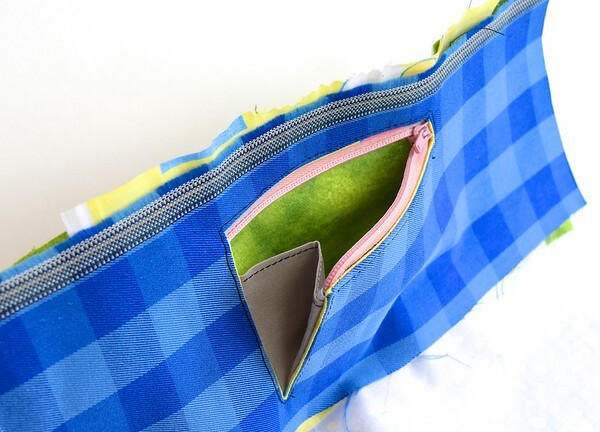 A smaller gap means an overall more secure pocket. 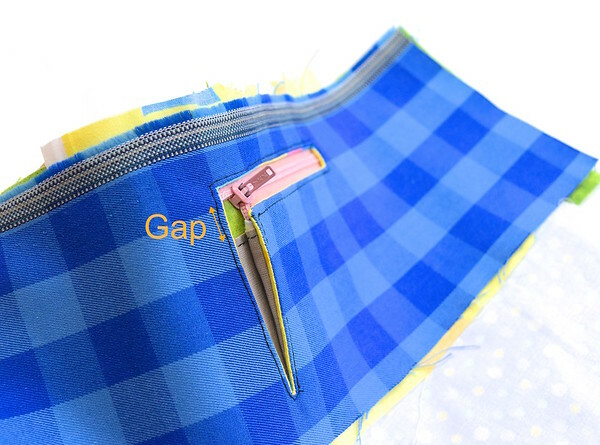 Most pockets do not have this issue, but the asymmetrically-aligned zipper tape of this pocket results in a gap where closures do not completely er. . . close. 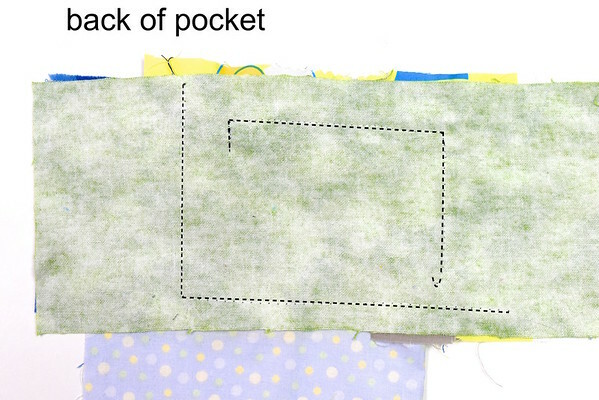 Just a thought to bear in mind as you make your own pleated pockets, okay? 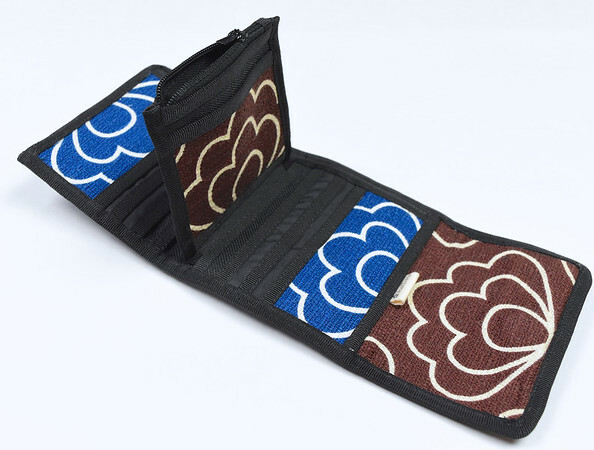 Since we're discussing pockets, let's do the grand tour of this wallet, so I can show you yet another pocket. and has no visible closure hardware. 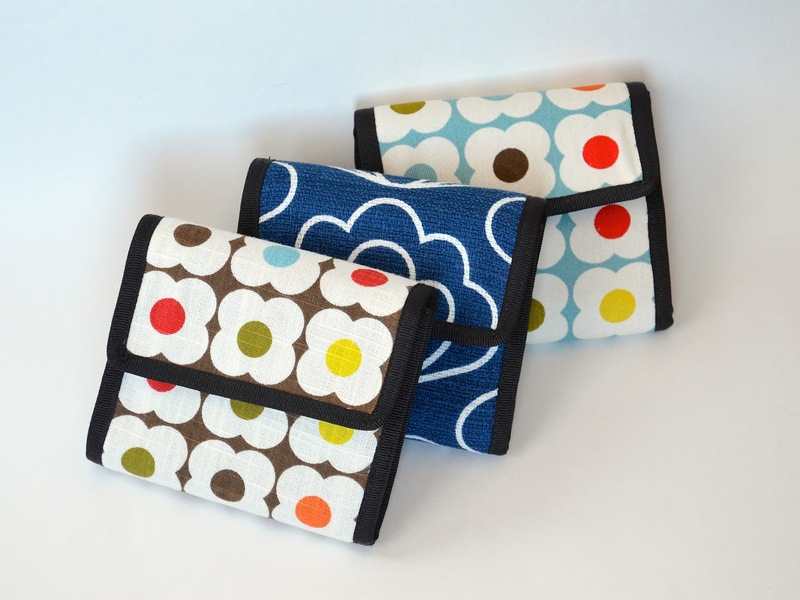 but otherwise, it, too, is just a simple zippered-edge pouch. My children are all grown up and out of the house. NO grandchildren in sight. I miss the push of coming up with "how to" ideas in creating things for them and with them. They also taught me it is okay to be silly. I am still creative (quilt and make bags) but they were my inspiration. Yes, Cherish these times. Nancy: Funny - I just got myself all stressed thinking of crafts for the wee ones to do this afternoon! Thank you thank you for this tutorial. My son and all the neighborhood boys built a giant wood trebuchet to launch stuff for endless entertainment. They even did maths to figure out the arm and velocities. This trebuchet occupied them for two years. The physics teacher refused to allow this project as extra credit because it wasn't on his list and instead my son spent 45 minutes building a solar oven for the extra credit and then promptly sold the oven to another kid. Waiting for grandchildren as well. kathy: what a pity the teacher didn't allow the trebuchet! I would've, if I were his teacher. Even more extra credit had it been made out of cardboard! We built a solar oven once - out of cardboard. It cooked an egg. Cool! I mean, hot! I love the way you describe your parenting experience. They grow up so quickly, and having the privilege of being home there with them is well worth the lost productivity. Yes! Thank you for this tutorial, you are my HERO!. 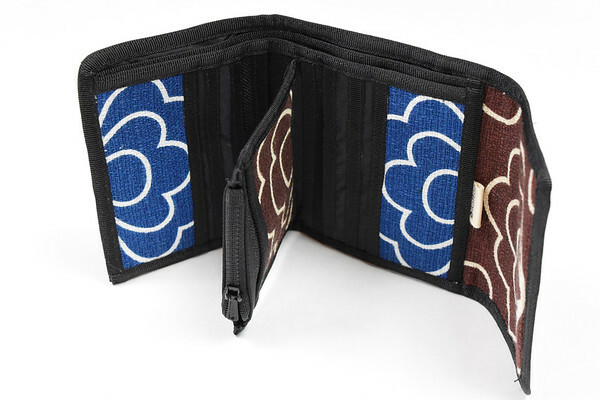 Ever since you posted a work in progress of the wallet (and the pocket) I've been searching high and low if anyone on the world explained how it works. 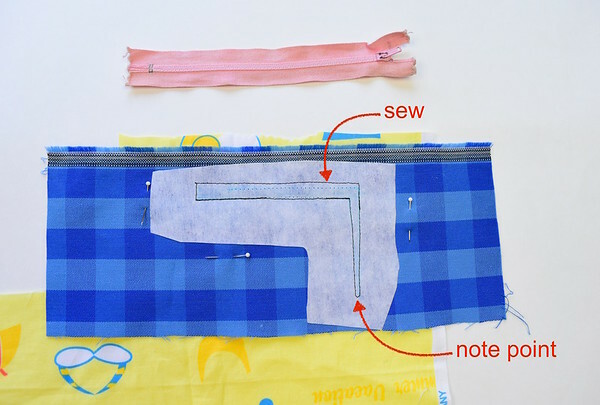 I'm a pretty advanced seamstress, but I don't think I ever would have figured it out on my own =) So for this (and all the other awesome things on your blog) you have my eternal gratitude. I hope you have any idea how much it means to me and so many others to have such valuable info available freely. You rock! I was going to say the same thing. I can figure out a lot of things, but this particular type of zipper has had me scratching my head for a while. Yay! I can't wait to use it! We want to see the kids' castle!! 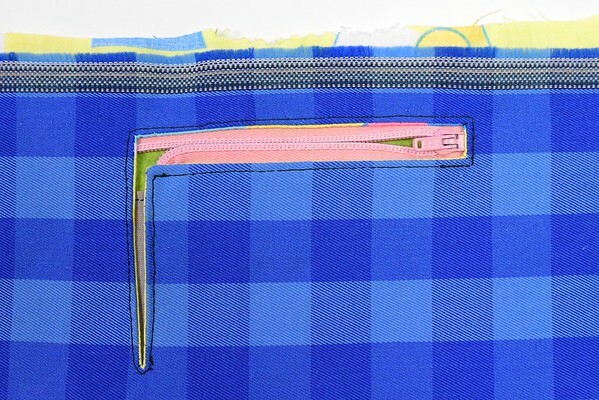 I am stunned by this zippered pocket!!! 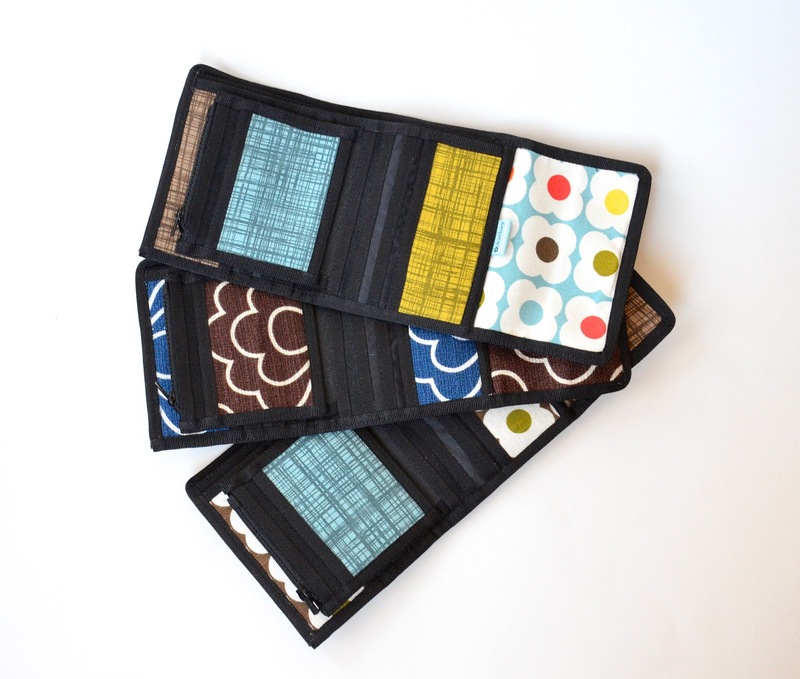 I have several wallets that have this type of pocket and I will never look at them the same way again. I may never make one of these but now I know what goes into them and how intricate and innovative the design is. 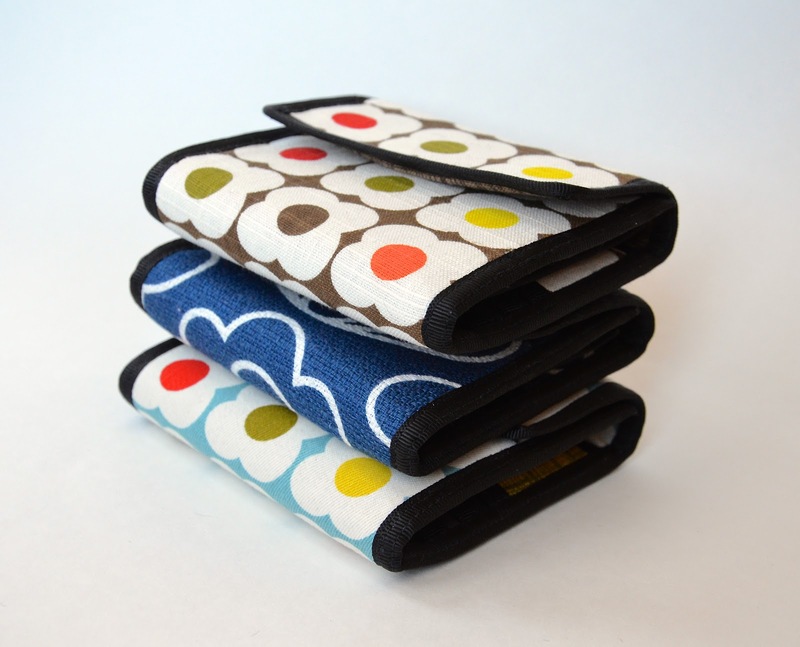 Thank you again for your whole zipper series. Thank you SO much for this! Beautifully written, clearly illustrated, logically ordered = genius! Hi, Thanks for this tutorial! 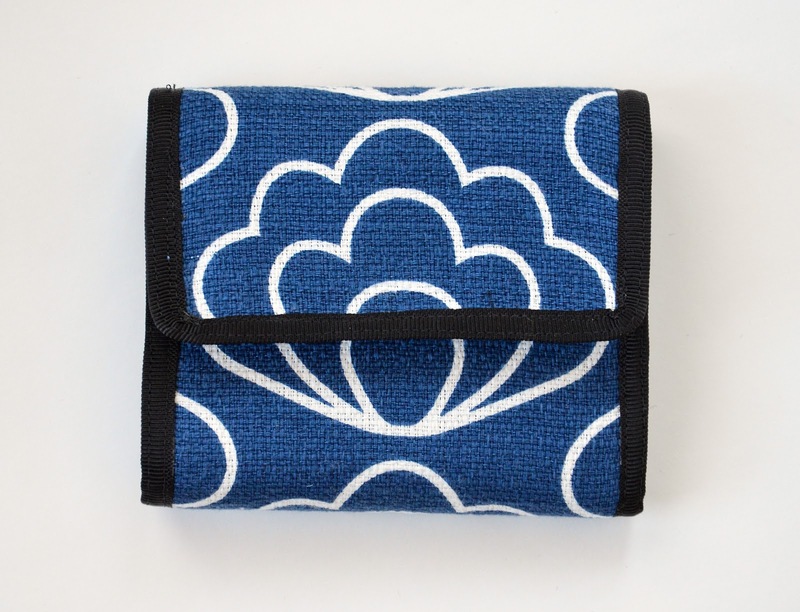 I'm curious if this would work with pleats on both sides? 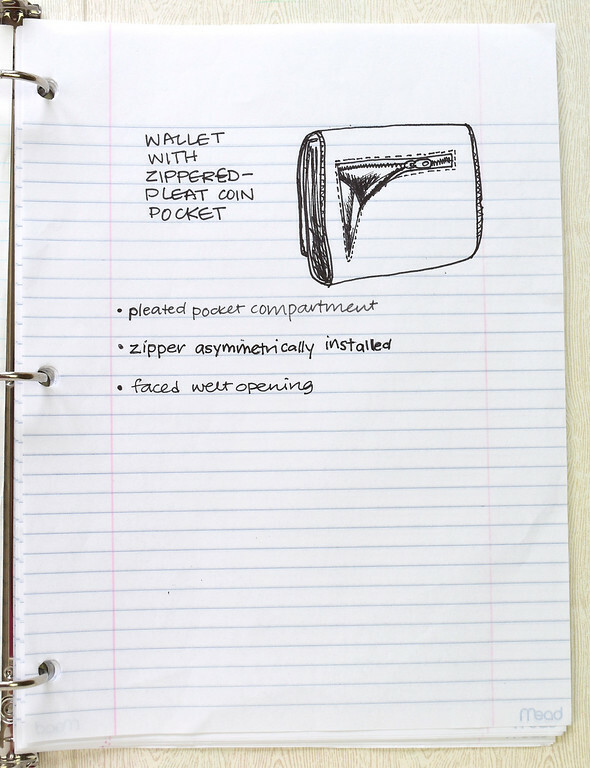 I'd like to create a similar pocket on a bag, but am worried about the mechanics of the zipper + pleats on both sides. Does that sound do-able to you? Yes, I think it's completely doable!